As before, the Centre was again able to make a substantial contribution to the Ian Coulson Memorial Postgraduate Award fund from the surplus generated by the Weekend, which is being used to help postgraduates studying Kent history topics – but more on that later. 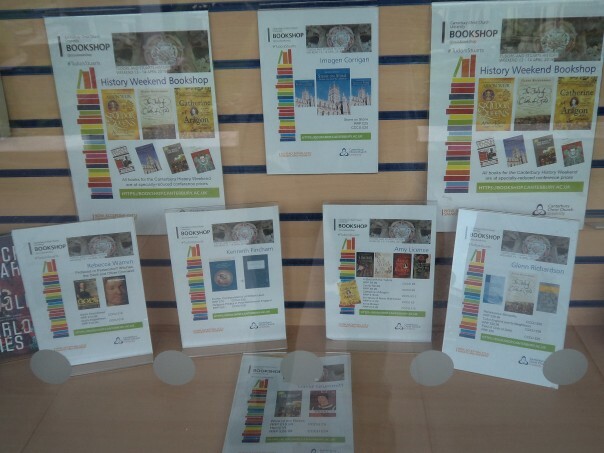 Inspiring the new generation of historians. Diane and Victoria Blud are in the process of editing a collection of essays from the conference proceedings and I believe they now have everything in except for the Afterword that Dr Leonie Hicks (CCCU), one of the keynote speakers, will be providing. This is a brilliant achievement and I shall look forward to its publication, hopefully in about a year’s time. 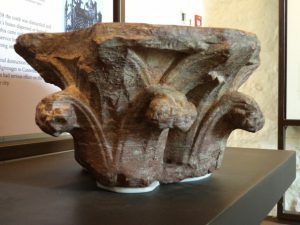 Probably from Becket’s shrine – previously in the Canterbury Heritage Museum, but where now? 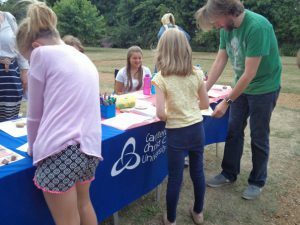 Looking at other joint ventures, 2017 saw a further cementing of the relationship between the Centre and the Friends of Canterbury Archaeological Trust because Dr Ellie Williams joined me on the FCAT committee. Ellie is an expert on osteoarchaeology, and, as well as being a member of the ‘Finding Eanswythe’ Heritage Lottery funded project with Dr Lesley Hardy and Dr Mike Bintley from CCCU and Dr Andrew Richardson and Annie Partridge from CAT, she will be working with the Centre next April [see next week’s blog for more details]. 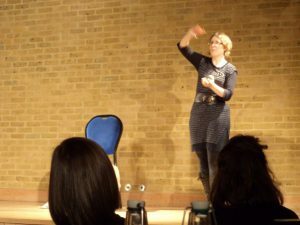 Dr Daisy Black’s one-woman dramatization – brilliant! 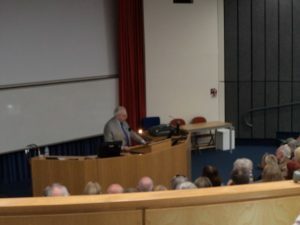 To return to this year and last Spring, the Centre with FCAT held a monthly series of evening lectures, including an evening symposium in March on ‘Normans in the Landscape’ that featured three speakers from CCCU: Richard Eales, Dr Paul Dalton and Dr Leonie Hicks. 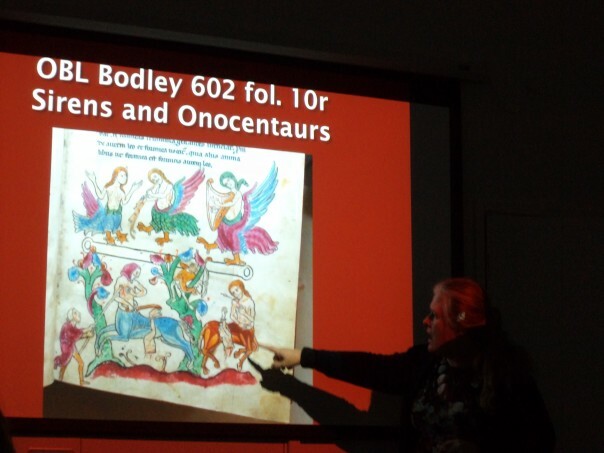 Thereafter, Diane and I also gave lectures in this series, Diane on the bestiary, while I explored what it was probably like for those arriving on pilgrimage in late medieval Canterbury. Since then there have been talks on various topics, including the archaeology of the Augustine House (CCCU’s library) and adjoining sites by Dr Richard Helm (CAT) and Clive Bowley’s assessment of Canterbury medieval timber-framed buildings. Other collaborative projects (see a whole range of Centre blogs from 2017) have involved Centre staff giving lectures for the Kent History Federation’s 1 day conference; for the Guild of One-Name Studies’ day conference; for various colloquia organised by the London Medieval Society; for Faversham Town Council with respect to its new medieval history centre near to the market square (the venture has also received a CCCU funding award); for a Chatham Historic Dockyard conference; for Medieval and Early Modern Studies at Kent University in collaboration with Rochester Cathedral Library; another collaboration with MEMS but this time with Canterbury Cathedral Archives and Library for ‘Picture this …’, and for ‘The Canterbury Journey’ team based at Canterbury Cathedral. This last venture is very close to Diane Heath’s heart because it involves the ‘Crypt Creatures’ – fabulous beasts and other stone carvings in the crypt that were the subject of a lecture by Professor Sandy Heslop (UEA), and then guided tours of these stone carvings led by Diane, Dr Emily Guerry from Kent University and me. To an extent Diane reprised these crypt tours during The Black Prince conference organised by ‘The Canterbury Journey’ team in November, while I chaired one of the conference sessions. 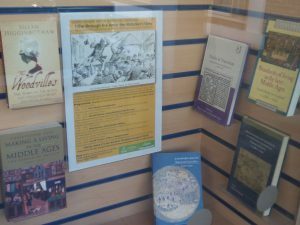 Book display at the CCCU bookshop for the Tithe conference. The Centre’s final event of 2017 was Paul Bennett’s second part of his inaugural professorial lecture in December that he dedicated to Lawrence and Marjorie Lyle, two stalwarts of the CAT and major friends of the Centre. As always, Paul provided fascinating insights into the archaeology of Canterbury and Kent, but he also looked in some detail at north Africa where over the decades he has undertaken a great deal of archaeological work. Dr David Starkey at the Tudors and Stuarts History Weekend. And with this I’ll close my round-up of the Centre’s activities in 2017 and next week I’ll review where next. You certainly had a busy 2017. I look forward to your work in 2018 – it makes for very interesting reading.